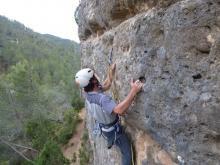 The province of Valencia, the least mountainous of the three, also offers spectacular locations for rock climbing, with famous areas such as the walls of the canyon of the Túria as it passes through Chulilla. Finally, it is worth pointing out Montanejos, in Castellón, a peerless destination for mountain climbing along with Jérica. The Valencia Mountain Climbing Federation (Federación Valenciana de Montañismo) offers specialised information on mountain climbing in the Valencia Region.